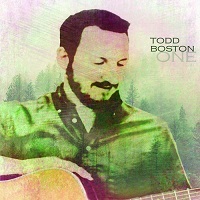 I have been aware of Todd Boston’s talents as a music producer and a musician for some time, but this is my first review of him. It turned out to be quite a pleasure. His last album, Touched by the Sun was released more than six years ago, so this is album, One is a long time in coming and a welcome arrival. The album is deceptively engrossing because Boston is a guitarist with a great deal of talent, but it is his compositional skills that are brought to bear on the recording. Several of the eleven contemporary tracks have no relationship to a guitar, yet every one of them is cohesive in musical texture and form. Take for instance the title tune One. It is an ethereal experience for bamboo flute and resonant waves of sound. The meditative qualities are beyond peaceful and soothing, and a fitting opening for an album that eschews a concept of universal unity. It suggests that everyone pause, take a breath, gain control, and relax. And I do and listen further. Fresh Strings is the kind of contemporary Boston guitar tune that I'm familiar with. It is one of those songs that your mind goes along with even though your body happens to be motionless at the time. The day is bright and new. The positive energies flow like a friendly stream. The ballad Astral Heart sees the return of Boston's sophisticated flute and strong guitar rhythms coalescing in a song that is boundless in its dynamism and weightless in its movement. One of my favorites on the album was a serious cut called Early Realization. I have to admit I was a bit stymied when I first heard it. What was going on? What is with all the chaos? It opens with a storm of strings and a somewhat discordant melody. There is a certain gravitas, a heaviness to the tune. After a bit of distillation, however, the eyes open as does the mind. In a world of darkness, it was as if I had seen light for the first time. Well done. Todd changes the mood with the fanciful tune Blue Pearl. His guitar has a strong voice, but the flute returns to answer his call. The intricacy of the tune is mesmerizing, the sound sometimes eerie. Todd uses a complex mixture of instruments on the tune that gives it a Zen vibe exuding mystery and esoteric ambiences. This is the kind of music that allows the listener to float off on a sea of sound waves, buoyant and free. On the tune, Hawk Medicine, I cannot help but wonder if Will Ackerman's song Hawk Circle had any influence on Todd's creation. Rich in harmonics and vivid in intensity, you can feel the strength of wings, the warmth of the sun, but most of all, the freedom of the wind. It is a beautiful, yet powerful rendition. The final cut is called Dreamtime. It is an expansive, sublime piece that further amplifies the subject matter found in Astral Heart. The tune is spatial, uplifting, and reflective, and the perfect arena for what it stands for. With more than a dozen instruments and an anomalous mix of New Age and contemporary genres, Boston has managed to create a recording of strongly related songs that unify a universal theme of oneness. Oneness of body, or an organic relationship to the planet, oneness of mind, but most of all, oneness of spirit. The music has myriad of uses, from meditation to loving, creating to praying. The music is multifaceted enough to offer repeated listenings without ever hearing it in the same way twice. Highly recommended.